Sit in style with our much-loved Mimi Real Leather Bar Stool Black. This much sought after model has a luxurious yet modern appearance and will stand out in any kitchen or dining area, bringing the room to life. The Mimi is a must-have with its elegance and class. 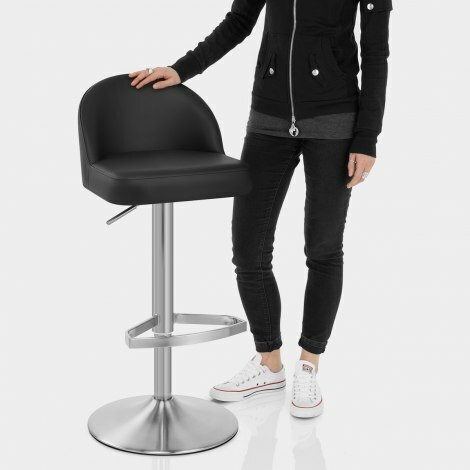 Designed with your comfort in mind, the seat is excellently padded, and boasts a mid-height backrest that curves round for ample support, all upholstered in beautiful black real leather. The elegant brushed steel frame creates a harmonious aesthetic when matched with other brushed steel kitchen appliances, whilst the fashionable footrest only adds to its trendy appeal. Plus, a gas lift mechanism allows for adjustable height and complete 360 degree swivel for premium mobility. Set on a strong base for stability, the Mimi also includes a protective floor guard to ensure your floors are well looked after. "I love these chairs, stylish, comfy, good quality"
Beautifully understated and packed with quality. 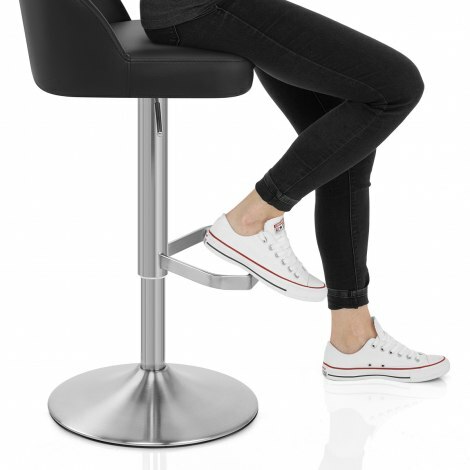 A very comfortable stool that feels stable and substantial without monopolising the kitchen. These stools are really lovely and go perfectly with our steel grey granite worktops. They were delivered the next day as promised and were easy to assemble. Great quality product and great customer service. The stools are exactly what we wanted, well made and not too bulky. Delivery was as requested. Can't fault the product or the service. We originally ordered two bar stools in cream leather.The website was easy to use and the stools arrived on time and were great but unfortunately not quite the colour we anticipated. We decided to visit the showroom to return the stools and to ensure we came away with the colour that suited us.There, we were given excellent service and advice, chose the colour we wanted and drove home relieved and happy. The stools were easy to put together, are good quality and very comfortable. We are delighted with them.